Somckit Khemmanivanh is an SAP Solutions Architect at Amazon Web Services (AWS). SAP HANA is a fully in-memory, columnar-optimized, and compressed database. The SAP HANA systems certified by SAP enable you to run your SAP HANA databases on systems ranging from 160+ GB of RAM up to 2 TB of RAM in a scale-up configuration. Certified scale-out configurations of up to 14 TB are also available. This system configuration flexibility enables AWS to scale to fit your business and IT needs. Please contact us if you have workloads requiring more memory—we’d like to work with you to satisfy your requirements. For an introduction to DMO, see the SAP Community Network. At a high level, you can use DMO to migrate an SAP system that is running on anyDB to run on an SAP HANA database. You can also use DMO to upgrade your SAP system’s software components and to perform a Unicode conversion as part of your migration. (Note that as of Enhancement Package (EHP) 8, Unicode is mandatory.) The standard DMO process is an online and direct migration from your source anyDB to your target SAP HANA database. When your migration target is an SAP HANA system in the AWS Cloud, you must have your network connectivity in place to facilitate this direct migration process. Additionally, with the standard DMO process, SAP has specific restrictions, as detailed in SAP Note 2277055 – Database Migration Option (DMO) of SUM 1.0 SP18. (The SAP Notes referenced in this blog post require SAP Service Marketplace credentials.) This SAP note mentions restrictions when performing DMO transfers over a network connection (that is, between data centers). In our own testing and experience, latency does have some impact on the DMO runtime. We can help you evaluate your architecture and design and suggest possible solutions; please contact us at sap-on-aws@amazon.com. On AWS, you have additional migration options beyond standard DMO. You can use automated migration products like ATAmotion, by AWS Advanced Technology Partner ATADATA, to replicate your source system (from your on-premises network) to AWS, and then use DMO to migrate the replicated system to SAP HANA. Please use the AWS Partner Solutions Finder to locate other AWS Partners who offer migration products and services. Once your source systems are in AWS, you can leverage the agility and flexibility of AWS services to test your migration and to perform live migrations. An example scenario would be to run multiple tests to optimize your DMO downtime. With each test, you can take advantage of EC2 instance resizing to try different system sizes and combinations. Create an AWS account, if you don’t already have one. 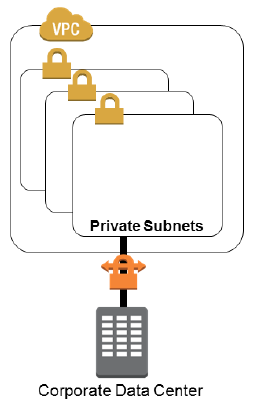 Establish virtual private network (VPN) or AWS Direct Connect connectivity between your data center and the AWS Region, as shown in this illustration from the AWS Single VPC Design brief published on the AWS Answers website. See the “Internal-Only VPC” section of the brief for design considerations and details. 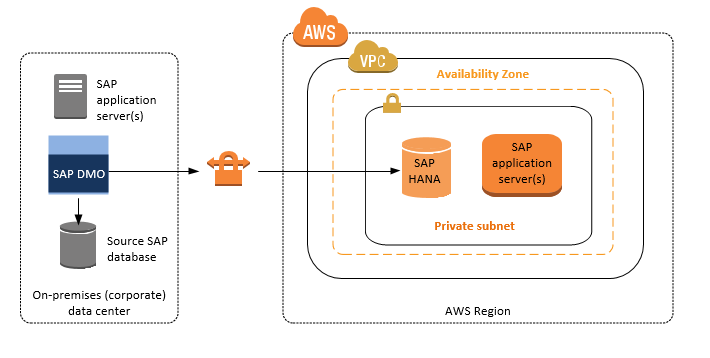 Establish VPN or AWS Direct Connect connectivity between your data center and the AWS Region, as shown in this illustration from the AWS Single VPC Design brief published on the AWS Answers website. See the “Internal-Only VPC” section of the brief for design considerations and details. Replicate your source system on AWS. If you’re using ATAmotion, the ATADATA console is used to perform this replication. Now let’s discuss some of the aspects of the architecture and design that are common to both migration options. For the network connection between your data center and AWS, you can use either a VPN or AWS Direct Connect, depending on how much data you need to transfer and how quickly you want to complete the migration. The amount of data to transfer correlates to the size of your target SAP HANA database. For example, if your source database size is ~2 TiB, the target SAP HANA database size may range from 250 to 600 GiB. (This estimate assumes the standard 1:4 or 1:5 times HANA compression ratio, although we have observed even higher compression ratios.) You would need to transfer 200-250 GiB over the network. You can get a good estimate of your target database size from the SAP sizing reports in SAP Note 1793345 – Sizing for SAP Suite on HANA and SAP Note 1736976 – Sizing Report for BW on HANA. We recommend that you establish a reliable network connection to avoid interruptions and having to resend data during the migration process. AWS Direct Connect offers the most reliability and bandwidth over a VPN connection. You will need to decide on the best installation option based on your organization’s requirements, constraints, sizing, cost, complexity, and other tradeoffs. There are many AWS technologies available to help streamline your SAP application server installation and configuration process. These include using AWS CloudFormation templates, creating an Amazon Machine Image (AMI) from a snapshot, and using the Amazon EC2 Run command. We will cover these topics in upcoming blog posts. SAP systems can resolve host names via DNS or through your local hosts file. We recommend that you use DNS in combination with SAP virtual names for your SAP systems. Using SAP virtual names will make the migration easier by allowing you to keep the same virtual name on AWS. For details, see SAP Note 962955 – Use of virtual or logical TCP/IP host names. SAP migrations are complex, and proper planning is needed to minimize any potential issues. We recommend that you first target smaller, standalone SAP systems to familiarize yourself with AWS and SAP on AWS. Such systems could potentially be sandbox, development, training, demo, and SAP Internet Demonstration and Evaluation System (IDES) environments. If you decide not to proceed with the SAP DMO migration, your existing source system will still be fully functional—you would just need to re-enable it. Drop us a line at sap-on-aws@amazon.com if you have any questions. For specific SAP on AWS support issues, please create an SAP Support Message with the components BC-OP-LNX-AWS or BC-OP-NT-AWS.